Zoom Commander is a Windows PC application that manages, controls, schedules and presents audio/video/image/interactive content playback on multiple remote Windows PCs over the Internet or local network with a straight-forward & clean user interface. Zoom Commander is a Windows PC application that easily manages, controls, schedules and presents 'audio / video / image / interactive' content playback on multiple remote Windows PCs over the Internet or local network with a straight-forward and clean user interface. In a 'Video Wall' configuration, Zoom Presenter is used to render Video, Image and Interactive content across multiple display devices as if the display devices are part of a single, larger display. In a 'screen zone' configuration, multiple Zoom Presenter instances are installed on one or more PCs to play diverse 'audio / video / image / interactive' content in separate zones within each 'Monitor / TV / Projector' display device. In a 'multiple screens' configuration, multiple Zoom Presenter instances are used on one or more PCs, with unique or duplicated media content playing on each connected display device or screen zone. Using Zoom Commander's integrated schedule editor, media and web content is scheduled for presentation on a remote screen at a specified time & date with optional priority and function. To manage an unlimited number of display devices and screen zones, Zoom Commander employs a TAG system to quickly identify and control multiple screen entries. 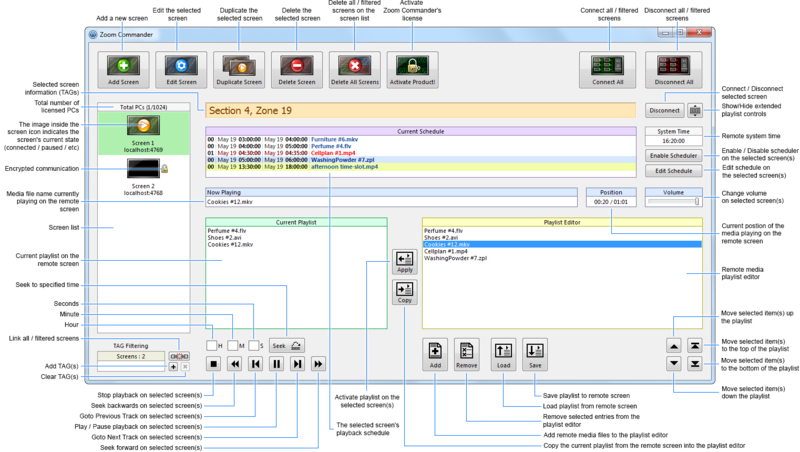 Using the TAG system, Zoom Commander can filter screen entries and 'Link' the filtered screens to apply playback Control & Scheduling to multiple screens concurrently. Zoom Commander's playback controls can play, pause, seek, edit playlist and volume level on a remote display device or multiple linked display devices, making it the ideal tool for remote media presentations. Leveraging cloud technologies, media content is quickly distributed across the internet. Learn how to setup Zoom Commander to take full advantage of the latest cloud technologies. Zoom Commander's web browsing technology integrates interactive screen zones with all the power of custom web design and beautifully rendered templates. threecubes Slideshow HD 2 allows you to create professional slideshows. Photos, videos, background music, text and effects are all arranged in a few easy steps, ready to be shown from your TV, computer and beamer. Free 3DPageFlip PDF to Flash Magazine is an easy-to-use converter for building flash slideshow magazine from PDF with multimedia content and fantastic transition effect! Using your mobile device: Play Music and Show TV, Videos, Pictures & Movies. Controls nearly all the functions of Windows Media Center or TotalMedia. Melodie is a Church Projection / Worship Software that can be used to display songs or Bible verses. Essentially, it is the overhead projector's 21st century replacement. iSpring Suite is an eLearning authoring software that enables you to quickly create interactive Flash-based e-Learning courses in PowerPoint. iSpring Suite generated courses ready for uploading to SCORM-compliant Learning Management Systems. Worship, Inc. is the revolutionary new software designed by musicians for the worship team. Store and maintain all your lyrics and chord sheets. Transpose songs at flick of a button, connect multiple PCs to share a live playlist and much more. It is an easy-to-use tool to convert digital photos to video and create stunning slide shows with transition effects. It provides dozens of transition effects,supports mutiple photo and audio formats, output AVI file with higher resolution than DVD. ShowPoint is a tool to enables you to send over a presentation to another computer and start its slide show automatically. This installer provides a Multiskin Player for AXMEDIS MPEG-21 Cross-media Contents. Customize your AXMEDIS Player according to your needs and style. The package contains AXMEDIS MPEG-21 demostrative contents as well. PPTX to EXE Converter is an application that will help you to convert PPTX created by PowerPoint 2007 and PowerPoint 2010 into professional sildeshow EXE files. This site does not contain serial number, crack, keygen Zoom Commander serial number : serial number is the simplest type of crack. A serial number(cdkey,product key,etc) is register the program as you may already know. a crack or keygen may contain harmful software. If you cannot find the exact version you want, just give it a try. for more information read .nfo/.txt/.diz file include in zipped file.